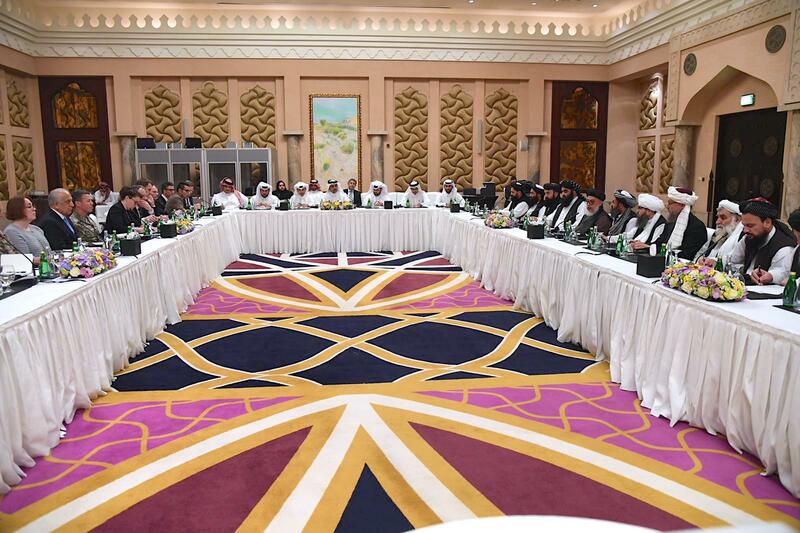 KABUL -- The Afghan government has welcomed the latest progress made in talks in Doha, Qatar, between US Special Representative for Afghanistan Reconciliation Zalmay Khalilzad and Taliban representatives. US and Taliban negotiators wrapped up their fifth round of marathon peace talks on Tuesday (March 12) with "real strides" made but no agreement on a timetable for troop withdrawal, the US special envoy said. "We welcome US efforts in Afghan peace process," Haroon Chakhansuri, spokesperson for President Ashraf Ghani, tweeted Tuesday. "We hope to witness a long term comprehensive ceasefire with the Taliban, and hope that direct negotiations [between the] Islamic Republic of Afghanistan and the Taliban begin soon," Chakhansuri added. "Just finished a marathon round of talks with the Taliban in #Doha. The conditions for #peace have improved. It's clear all sides want to end the war. Despite ups and downs, we kept things on track and made real strides," Khalilzad tweeted. "Peace requires agreement on four issues: counter-terrorism assurances, troop withdrawal, intra-Afghan dialogue, and a comprehensive ceasefire," he said. The sides reached agreement "in draft" on the first two issues, he said. Khalilzad added the next step would be discussions in Washington but warned that "there is no final agreement until everything is agreed". The talks in Doha focused on the withdrawal of US troops and assurances that insurgents would not use Afghanistan's territory to stage future terrorist attacks -- one of the initial preoccupations of American policy in the wake of the 9/11 attacks back in 2001. "Progress was achieved regarding both these issues," said a Taliban spokesman. "For now, both sides will deliberate over the achieved progress, share it with their respective leaderships and prepare for the upcoming meeting." To be honest, it is unfair that Americans are holding negotiations with Taliban in absence of the Afghan government. This shows Americans' unfaithfulness towards a friendly system. Besides, I have heard that as a result of these negotiations, America will release a Pakistani terrorist, Aafia Siddiqui. If it is true, Doctor Shakeel Afridi who are in Pakistan's jail should be released in exchange. Afridi has achieved a task which had not only rescued Pashtuns but also the whole world from a big misery, and Americans should put pressure on Punjabis [Pakistanis] to release him. Pakistan can do whatever they are asked for in exchange of money. We do not want the regional countries to make deals over Afghanistan and each country score its own concessions. We want an intra-Afghan peace through which interests and future of Afghanistan is guaranteed. whatever achieved in absence of Afghan government can never be in favor of Afghans. Intra-Afghan talks are the only solution for peace, said US Special Representative for Afghan Reconciliation Zalmay Khalilzad.